Question:I am a fifth year associate and I am in the process of looking for a new position. 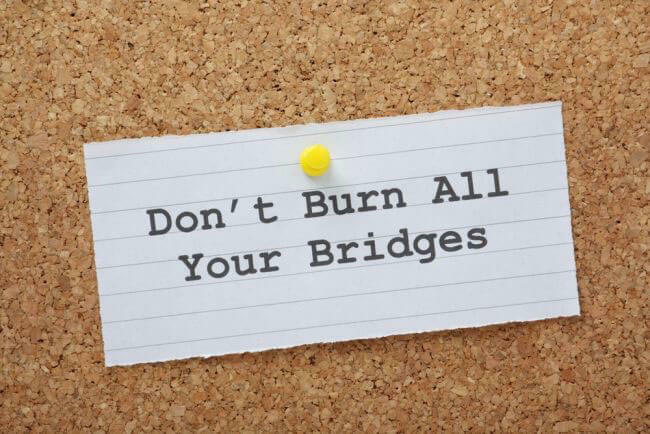 How can I look for a new job without “burning bridges” with my current employer? Answer: It is very difficult to look for a new position while you are employed. However, the vast majority of job seekers are currently employed and they navigate this tricky path successfully. The first concept you must accept when you find yourself in this position is that there will be a certain amount of subterfuge. You cannot announce that you are considering other options without the risk of being fired, and so you must behave discreetly and perhaps even deceptively during your search. It is critical that you continue to do your work at your current position and behave in a manner that is professional. Once you decide to leave an employer, it is tempting to begin to slack off because you are no longer "invested" in your future with such employer. However, if your goal is to maintain an amicable relationship with your current employer in the future, then you must continue to meet your obligations. Your current employer may not acknowledge your efforts immediately, but in the long run, they will appreciate the fact that you behaved honorably. Scheduling interviews raises a host of issues, and here is where you may have to be deceptive. If your prospective employer can only meet in the morning, then you are faced with either taking a personal day or lying to your current employer. It is very hard to justify an entire personal day if you only have a half hour screening interview in the morning. Here again, it is important that you focus on your current obligations. If you tell your employer that you have a doctor's appointment at 10:00 a.m. (when you really have a screening interview), then you may have to stay late to complete your work. It is far better to try to schedule your screening interviews for lunch time (between 12:00 and 2:00 p.m.), or even after work at 5:30 or 6:00 p.m. I recognize that the foregoing is not always possible, but I would reserve my personal days for second round interviews because second round interviews generally take several hours. The less you have to create excuses with your current employer, the more you increase your chances of having a good relationship with them in the future. Often when an employee leaves a position, the current employer is upset, disappointed, and possibly even angry. In order to soften the blow of leaving, it is very important that you do not insult your current employer. For example, if you are leaving a firm to go in-house, it is much easier to tell your employer because the opportunities are so different. If, on the other hand, you are leaving your current firm for a comparable firm, then it is much harder. You need to create reasons why this particular move is much better for you without criticizing your current employer. In fact, you should make every effort to tell your employer how much you appreciate them, and how much you have learned while in their employ. You should try to distinguish the new opportunity in a way that is palatable. You might indicate that the new firm is going to allow you to focus on a particular area that is not available at your current firm. It is important to know that even if you continue to meet your obligations; schedule your interviews at lunchtime or after work; and provide a solid professional reason for leaving, you may not be able to salvage your relationship. The good news is that if you do all of the above, you will know that you have done everything you could do to try and maintain the relationship.